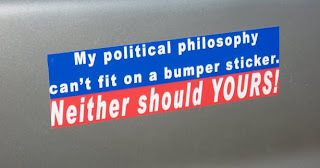 can't fit on a bumper sticker. Says what it means. Means what it says. I came up with the slogan about two weeks ago, designed it in Photoshop and had CafePress print it and ship it to me. It replaces the "Ron Paul for President" sticker that has been on my bumper for almost two years. Which that one wound up striking up lots of good conversation with folks who saw it decorating my car, and hopefully this new one will stir up even more.